At the end of April, Honey was admitted to the hospital after suffering from back pain and hind leg weakness due to a slipped disc in her spine. She required strict rest so her owner decided to leave Honey with us in the hospital for a few weeks. She was put onto treatment to relieve the pain and to reduce the inflammation. Although a little tentative to begin with, Honey started to enjoy a cuddle with the nurses as she gradually started to feel better in herself. It was lovely to see her greeting us with a waggy tail and she was quite happy to potter about in the garden with the nurses. She went home on the 6th June and all was well until she suffered a set back two weeks later. Poor Honey was in a lot of pain and she was having difficulty standing. 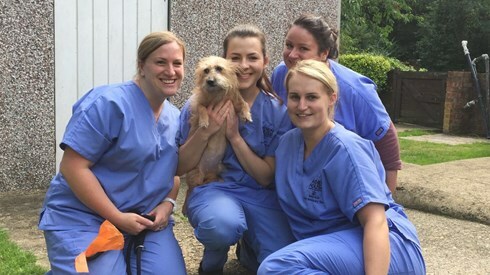 After some emergency treatment, it was decided that Honey needed to be referred to a specialist veterinary hospital for further treatment. At the referral hospital Honey was given an MRI scan that revealed some disc extrusion in her lower back (lumbar spine) that was pressing on her spinal cord. She required immediate surgery to remove the disc material and relieve the pressure. 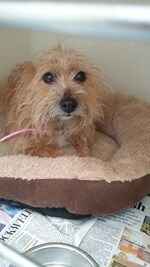 Honey also suffers from a heart condition so it was an anxious wait for Honey’s owner as she underwent the operation. This brave little dog recovered very well from the surgery and she continued to receive nursing care at the referral hospital for a further 5 days. Honey's surgeon was really pleased with her progress and on the 1st July, Honey was allowed home. She was discharged with a strict exercise regime that started with 4 weeks of confinement in which she was only allowed out into the garden on a lead for toilet breaks. Although Honey’s owner knew she’d miss her terribly, she decided that she’d benefit from another stay with us. Honey’s owner was also in the middle of finalising her house sale, so having Honey stay with us to recuperate was one less thing for her to worry about. Honey settled in well but was a little apprehensive of being touched. With a little coaxing and some juicy chicken treats, she gradually gained confidence and was soon back to her happy self. On the 6th August, with her owner’s move complete, Honey went home - to her new home in Somerset.